This 80-Piece Deluxe Art Set overflows with color and creativity! 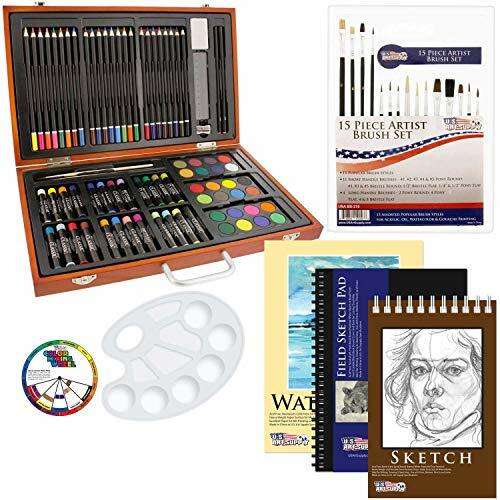 This art kit includes a wide variety of art supplies for drawing, painting and more - it s a great choice for beginners and serious artists alike. The kit includes a wide variety of supplies, including: 24 color pencils, 24 oil pastels, 24 watercolor cakes, 2 paint brushes, 2 drawing pencils, a pencil sharpener, kneaded eraser and sanding blocks, all in an attractive wooden carrying case. The carrying case is also compact and portable, making it easy to bring along with you to wherever inspiration lies! 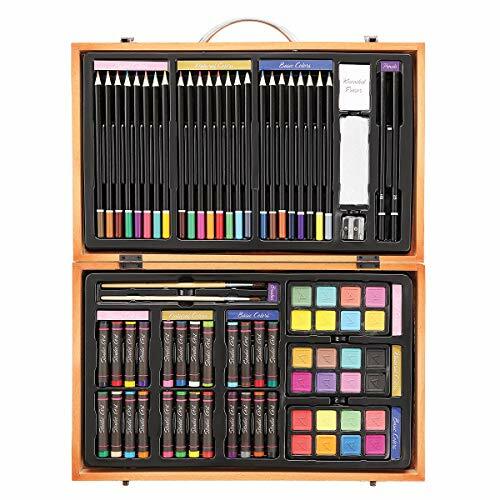 This deluxe, 80-piece art supply set makes a great gift for budding new artists and serious artists as well it s a great value for a large amount of art supplies. Includes small parts, art kit not for children under 3 years. 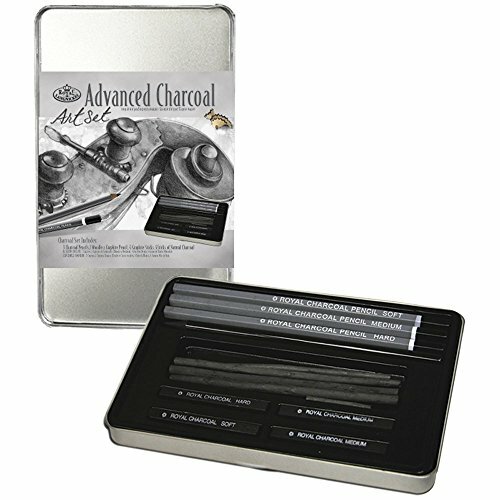 This professional sketch & drawing art tool kit, all accessories are complete. Included is 18 premium graphite pencils, 3 charcoal pencils, 3 paper erasable pen, 4B soft eraser, kneaded eraser, pencil lengthening device, craft knife. It is not only used for professional drawer or teacher, but also suitable for art students and beginner. Each kit also comes in a random color canvas rolling pouch, easy to carry it everywhere. 2. 3 Charcoal Pencils. The hard, medium, soft are contained. Easy to perform a high-impact effect, but not easy to break. Crayola Create & carry is the 2-in-1 art storage case and lap desk that contains a variety of cool Crayola art tools! Includes 16 construction Paper crayons, 8 washable gel-fx markers, 8 classic fine line markers, 12 short colored pencils and 30 sheets of construction paper. This all-in-one carry case makes a great gift! 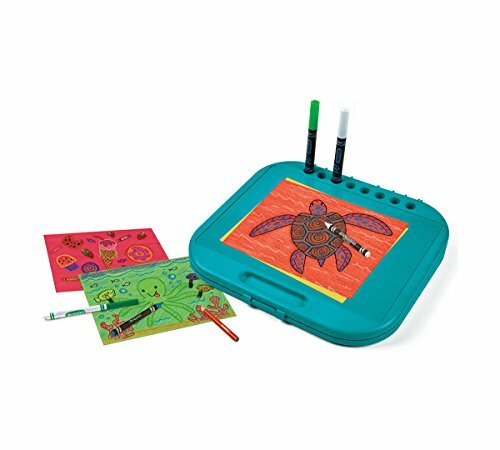 CRAYOLA CREATE & CARRY is a 2-in-1 art storage case and lap desk with a variety of cool Crayola art tools! 16 Construction Paper Crayons, 8 washable Gel-FX Markers, 8 Classic Fine Line Markers, 12 Short Colored Pencils and 30 sheets of Construction Paper. 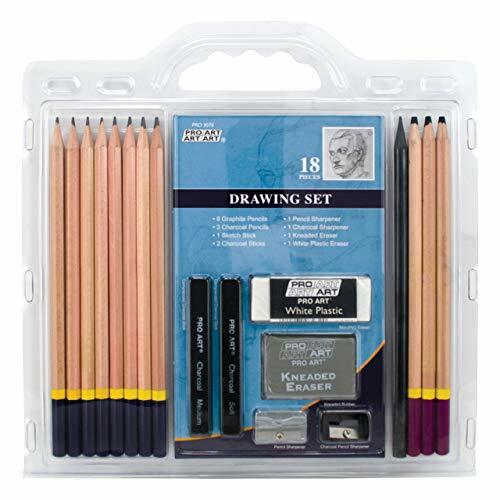 Order for the novice or the veteran artist, this complete professional drawing and sketch set is sure to delight! Begin drawing as soon as you open the package. Complete with a 100 page sketch pad of medium weight, non-smudge professional sketching paper, you will be ready for action. Set comes in a durable zippered nylon carrying case. 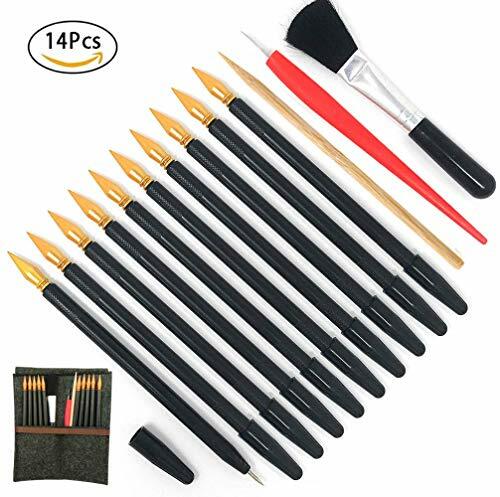 Features: A complete 34 piece high quality drawing set. Perfect for beginners or amateurs. Used for drawing, sketching and writing, and suitable for anyone above 3 years old. Comes with zipped carrying case, so your kit will always stay organized. All products are made of eco-friendly material. This set is sure to help you to improve your skills and cultivate your hobby. FreeHand: Free Hand Art Supplies represents superior quality and customer service with your highest satisfaction or a money back guarantee. We are confident you will enjoy this product. NOVICE TO PROFESSIONAL: start sketching as soon as you open the drawing kit! Complete drawing supplies set with a sketch pad, art pencils, kneaded eraser, pencil sharpeners, and more. PENCILS, ERASERS, 100 PG SKETCH PAD: Equip yourself with sketching pencils ranging in size from the thickest, 8B, to the finest, 5H for exact drawing lines. Art pencils for drawing and shading allow you to develop technical skills. Used for kids art supplies as well as adults. TRAVEL SIZE CASE: features a zippered pencil case, compartmentalized for all your supplies. This art set is sure to please! Set your loved one down a creative path, equipping them with their first complete sketch set. QUALITY GUARANTEE - Free Hand Art Supplies stands by our superior quality and customer service with your highest satisfaction or a money back guarantee. We are confident you will enjoy this art set! This 120-Piece Deluxe Art Set overflows with color and creativity! This art kit includes a wide variety of art supplies for drawing, painting and more - it s a great choice for kids and adults, too. The art set includes a wide variety of supplies, including: 24 markers, 24 crayons, 24 color pencils, 24 oil pastels, 12 watercolor cakes, 2 clips, 1 white watercolor tube and 1 of each: palette, paintbrush, drawing pencil, sharpener, eraser, ruler, sponge and scissors, all in a plastic case. The carrying case also has a snap-shut, keeping all the supplies organized and neat. 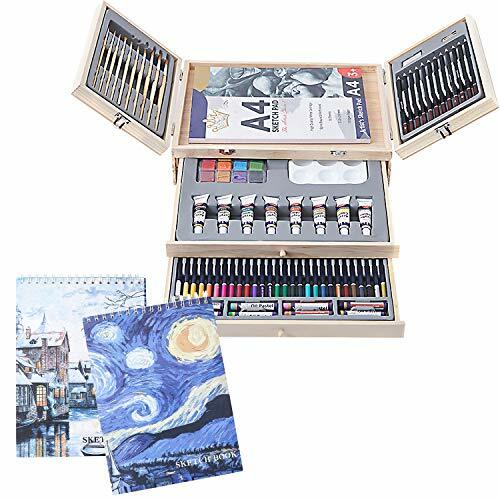 This 120-piece art supply set makes a great gift for kids and adults it s a great value for a large amount of art supplies, and allows for experimentation with a variety of artistic media. Includes small parts, art kit not for children under 3 years. VERSATILE SET INCLUDES - This 120-piece art kit includes: 24 markers, 24 crayons, 24 color pencils, 24 oil pastels, 12 watercolor cakes, 2 clips, 1 white watercolor tube and 1 of each: palette, paintbrush, drawing pencil, sharpener, eraser, ruler, sponge and scissors, all in a plastic case. PORTABLE PLASTIC CASE - A plastic case with a snap-shut handle holds all the art supplies and keeps them neat and organized. It's portable, too, so you can easily bring it to wherever inspiration lies! 88 Vibrant Permanent Markers resist fading over time. 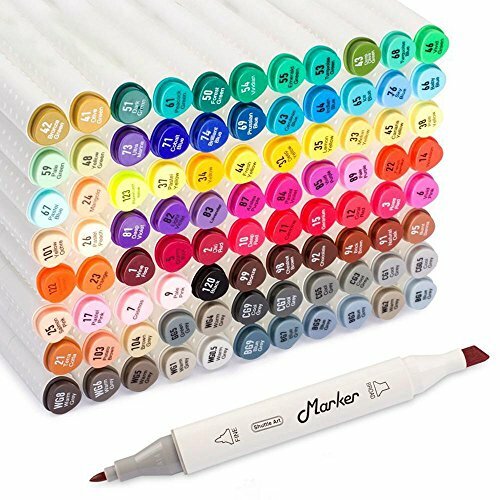 Shuttle Art Dual Tip Permanent Markers are rated for 300 meters of continuous use which provides you a vast amount of ink per marker and are non-toxic and acid-free. Perfect for use on paper, ceramics, glass, wood, cloth and more. 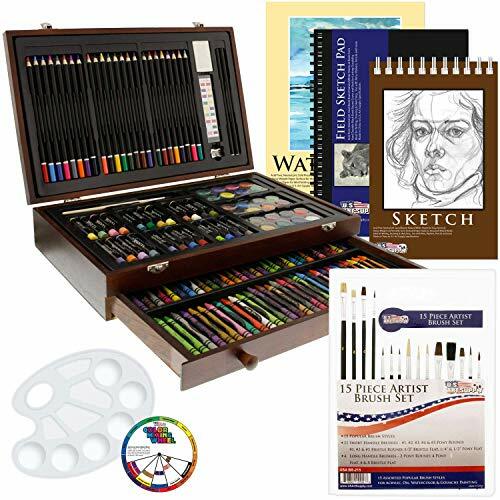 Order for the beginner or the veteran drawing artist, this complete professional Deluxe art set is sure to delight. With this deluxe art set you can begin drawing and painting as soon as you open the package. set will help them create their masterpieces and sharpen their artistic talents! 1-Wooden Case 13.7"x 3.74" x 10"
Note For ages 8 and up.Item contains small parts. Not for children under 3 yrs. Please do not hesitate to leave us a message if you have any questions. We will respond to you within 24 hours And offer you our best services. 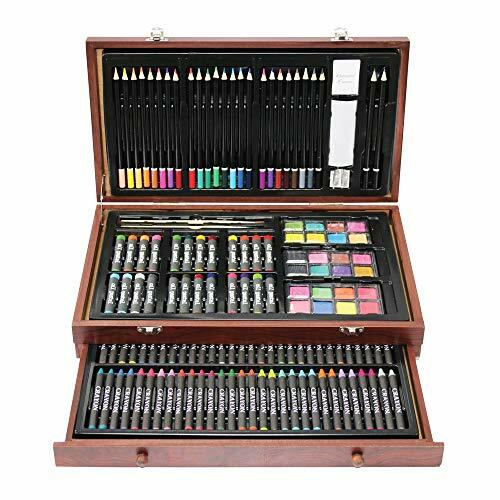 BEGINNER TO PROFESSIONALS: With this 85 Pieces Deluxe Art Creativity set you can begin drawing and painting as soon as you open the box. Comes complete with all the necessary tools for a beginning artist all the way to a veteran.Perfect art set for adults and kids. THE ESSENTIALS: 12 Sketching pencils(B-6B,HB,H-5H), 12 Watercolor cakes, 8 Acrylic paints, 28 Watercolour pencils, 10 Artist brushes, 8 Oil pastels, 1 Plastic palette,, 1 Putty eraser, 1 Wooden sharpener 3 x 50 Page Drawing Pad+1 Wooden Case 13.7x 3.74 x 10 . This set has everything you need to be an artist. 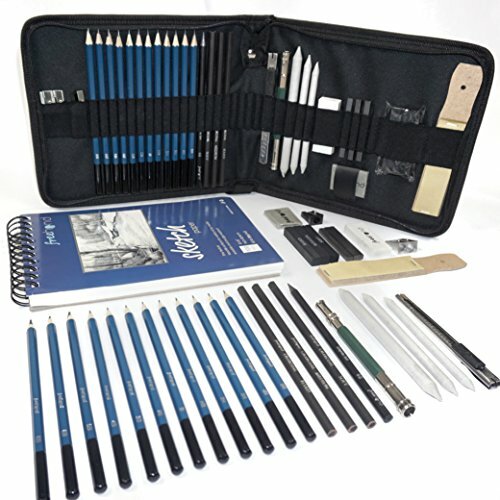 WIDELY USE &TRAVEL SIZED KIT: This art set is perfect for both students, hobbyists who love scrapbooks and even professional drawers working on craft or construction paper, detail sketching and high-level artistic skills, it is best tools to showcase someone's awesome drawing talent. Our gorgeous colors and design tools are neatly organized and arranged in a wood case so you can create art wherever you go. NON-TOXIC 100% SAFE FOR KIDS from 3 years old. We put children's best interests first. Every crayon, paint and pastel in this art box is non-toxic, and conforms to ASTM D4236 (Standard Practice for Labeling Art Materials for Chronic Health Hazards). Acrylic paint colors feature a density that is balanced while fluid and flexible.Essential acrylic paint brushes feature comfort handles and soft flexible nylon bristles. QUALITY GUARANTEE: Some of the paint may dry out as the products are stored in amazon warehouses.But don't worry, Cool Bank Art Supplies represents superior quality and customer service with your highest satisfaction or a money back guarantee. Any problems easily contact us to get the money back or a replacement. We are confident you will enjoy these art sets, complete with all other items the artist needs. All the art supplies for artists in one place! drawer.In short, if they can dream it, this set will help them create their masterpieces and sharpen their artistic talents! 1-Hinged wood case with drawer 14.8 x 3 x 9.5 inches with a weight of 4 pounds. 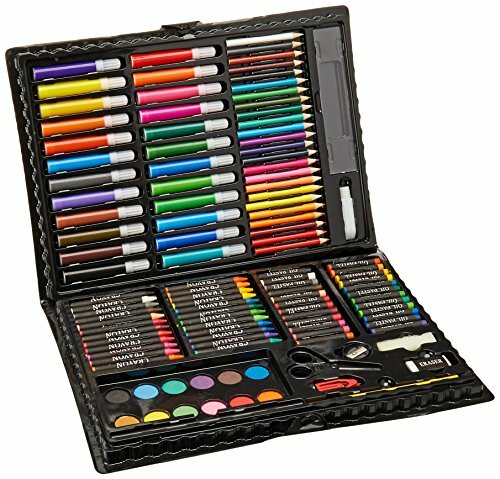 BEGINNER TO PROFESSIONALS: With this 145 Pieces Deluxe Art Creativity set you can begin drawing and painting as soon as you open the box. Comes complete with all the necessary tools for a beginning artist all the way to a veteran.Perfect art set for adults and kids. 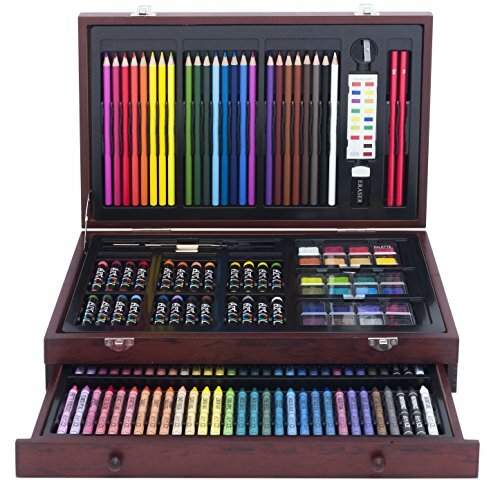 THE ESSENTIALS: This art set contains a remarkable 145 pieces - 60 crayons, 24 oil pastels, 24 color pencils, 24 watercolor cakes, 2 brushes, 3 8-well palettes, 2 drawing pencils, 1 sharpener, 1 sandpaper block,1 art eraser 2 x 50 Page Drawing Pad+1 Wooden Case 14.8 x 3 x 9.5 inches . Gift this drawing kit for kids&teens and start someone down a creative path, equipping them with their first art set. WIDELY USE: This Cool Bank versatile art set is perfect for both students, hobbyists who love scrapbooks and even professional drawers working on craft or construction paper, detail sketching and high-level artistic skills, it is best tools to showcase someone's awesome drawing talent. NON-TOXIC&TRAVEL SIZED KIT: 100% SAFE FOR KIDS from 3 years old. We put children's best interests first. Every crayon, paint and pastel in this art box is non-toxic, and conforms to ASTM D4236 (Standard Practice for Labeling Art Materials for Chronic Health Hazards). Our gorgeous colors and design tools are neatly organized and arranged in a handy rich mahogany wood case with a convenient removal drawer so you can create art wherever you go. QUALITY GUARANTEE: Cool Bank Art Supplies represents superior quality and customer service with your highest satisfaction or a money back guarantee. We are confident you will enjoy these art sets, complete with all other items the artist needs. All the art supplies for artists in one place! 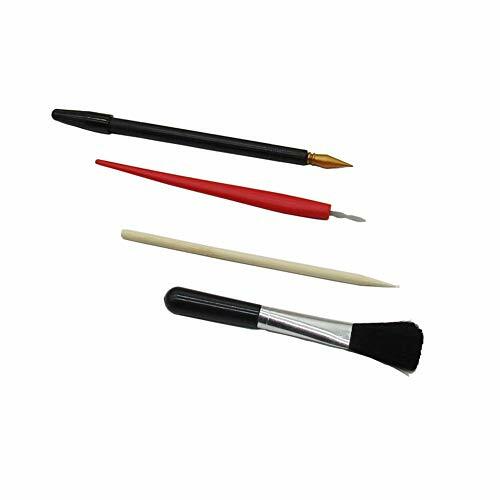 The scratching paper art kit, set includes bamboo sticks, scraper, scratch pen and black brush. You can reveal the beautiflu color on the pre-outlined scratching papers via the pen to finish it as a complete painting. This is the kit you will need to begin to learn to do scratch art. THE ANERZA ADVANTAGE The special hollow design makes the pencil grips have good breathability. CERTIFIED SAFE Writing aid grip made of 100% High quality silicone.non-toxic,odor-free. MEET DIFFERENT NEEDS Handwriting pencil aid grips are available for kids, adults, autism,lefty or elderly people with arthritis and hand tremors ,learning writing tool can be used as occupational therapy. Posture Correction trainer Grip can be used for pencils,colored pencils,mechanical pencil,crayons. 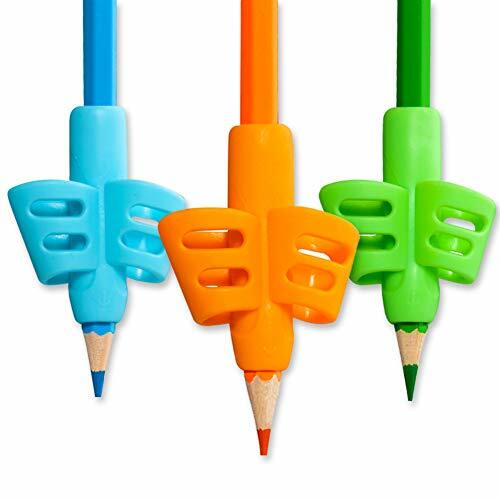 PENCIL GRIPS SET The package contains 3 different color double finger pencil grips. SERVICE GUARANTEE 100% Return. If at any time you don't absolutely love the quality of our pencil grips, let us know and we'll make it right. Fabric: Soft, Comfortable, Stretchy, Breathable, Skin-friendly. A great gift for kids, beginner and veteran artist. 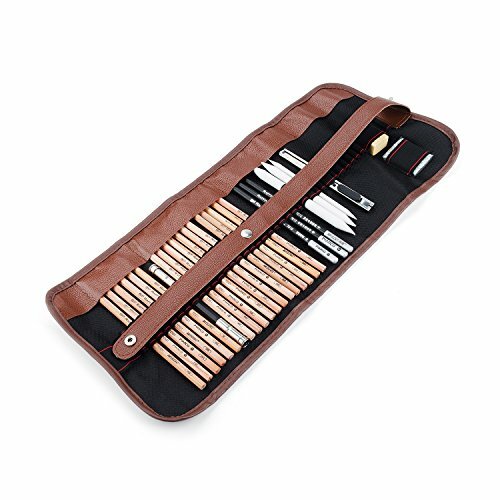 All drawing and painting tools are in one wooden case. With this deluxe art set you can begin drawing and painting as soon as you open the package wherever you go. In a word, if they can dream it, this set will help them create their masterpieces and sharpen their artistic talents. All of your art supplies come in a high quality, convenient wooden carrying case. Use it to store and keep all of your artistic tools organized, making them easy to use anywhere you feel creative! NOTE: For age 3 and up. Item contains small parts, does not suitable for under 3 years. 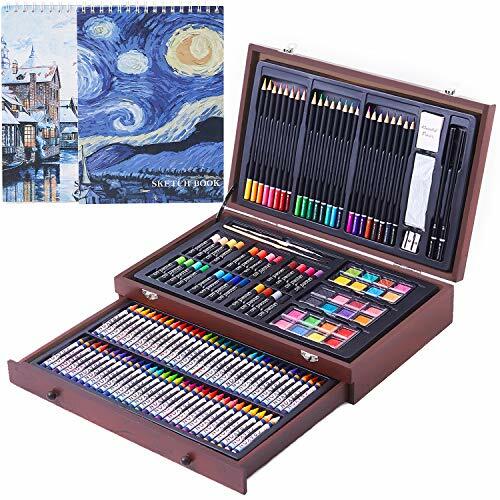 [ARTIST PROFESSIONAL TOOL]: This Deluxe art set included all drawing and painting tools that suitable for beginning and veteran artist. Perfect art set for adults and kids. [ART SET INCLUDE]: This art supplies included 1 wooden storage case, 24 watercolor cakes, 1 sandpaper block, 2 drawing pencils, 3 8-well palettes, 24 color pencils, 24 oil pastels, 1 art eraser, 1 sharpener, 60 crayons, 2 brushes. Great gift for kids who like drawing and painting. [WIDELY USE]: This art set is perfect for both students, hobbyists who loves scrapbooks and even professional drawers working on craft construction paper, detail sketching and high-level artistic skills. It is the best tools to show someone's awesome drawing talent. [SAFTY AND ENVIRONMENTAL ]: This drawing and painting art set is no harm for children. Each crayons, pencils and pastels in this art box are non-toxic, and conforms to ASTM D4236 (Standard Practice for Labeling Art Materials for Chronic Health Hazards). These art supplies are in one wooden case with handheld, convenient to carry, so you can create art wherever you go. [SATISFACTION GUARANTEE]: We promise this art set is very safety, children can use them relieved. We are so confident that you'll love this sketching art set and we also give you one years hassle-free Money Back Guarantee. AOLVO Sketch Wizard - A perfect gift for zero-based painting lovers, you can paint lifelike images on any kind of canvas / paper WITHOUT any painting foundation ! Inherited 19th century optical painting, lens imaging, not projection, through the lens observation, you can see the image on the canvas. 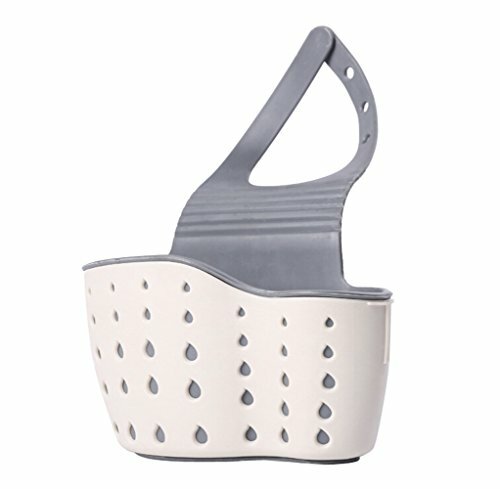 User-friendly design, maintaining the original painting posture. Say goodbye to sulfuric acid paper replication, optical imaging allows you to draw directly on opaque materials such as canvas bags, T-shirts, rubber stamps, etc. Support mobile phone and tablet use, bid farewell to print agency printing. The mobile phone screen is small, you can draw a large picture by splicing. Optically coated PMMA lens, reducing ghosting, and is a resin material, not brittle. How to draw with sketch wizard? 1. Complete the assembly of the sketch wizard according to the instructions. 3. Place the phone on the bracket and place paper under the lens. 4. Looking down through the lens, you can see that the image of the phone is clearly projected on the drawing paper, and you can draw trace the projected image. Your satisfaction is our very top priority. Any problem with the Drawing Kit , please contact us and we will definitely offer a satisfactory solution. 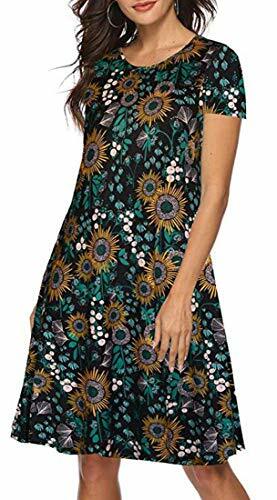 Add to Cart Now and Enjoy It Earlier! NOTE: In order to guarantee the quality of the products you purchase, please look for the AOLVO brand holding store LT-F to purchase. OPTICAL IMAGE DRAWING: Project images reflection on Premium optical PMMA lens, that you can draw on any opaque material. SMART APP: Download the app and you can convert the image to a sketch. The APP have multiple functions and can be used to make various custom adjustments to the image. 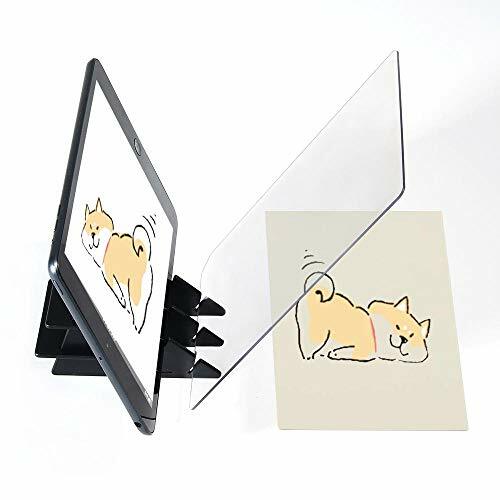 EASY TO OPERATE: Just need to download the APP, import the picture, put the phone on the shelf, and then you can start painting without drawing skills. IMAGE CUSTOMIZATION: You can import any image into the app, which realizes unlimited resources, network pictures and photos can become materials. APPLICABLE PEOPLE: Suitable for children, adults, comics/anime lovers, with 0 basic painting experience. Help develop hand-eye coordination and basic drawing skills. Customers may receive our upgraded products. We upgrade the material of the wooden frame to a black plastic ABS frame. The new material is more sturdy, please feel free to use it. Wonderful and complete scratching paper art kit, allow you to quickly and conveniently draw beautiful patterns. Suitable for birthday gifts, holiday gifts, Christmas, Thanksgiving gifts for your children, friends and classmates. Scratch tools are suitable for using on scratch art surfaces, especially for detailing drawing, which can enhance children's artistic ability, the fine details you can get is incredible. Pointed part included, please keep away from kids under 3 years old. Perfect Scratch Art Tools Wonderful and complete scratching paper art kit, allow you to quickly and conveniently draw beautiful patterns on scratching papers or Scratch board, convenient to DIY art painting. Scratch Coloring Pen Curved and smooth shape for easy use and comfortable grip for long-time work. Safe Dual Tips Design The tip can be used for detailing drawing, and also come with cap for protecting. Easy To Use Scratch pen and bamboo stick are applied to scratch the black surface of the cardboards and reveal rainbow colors; Scraper is applied to makes thin detail strokes on scratchboard; Brush is applied to clean the surface. Great for art design Good tools for children and adults painting on scratching papers or scratchboard, suitable for children and beginners' creativity and imagination at different ages; Great as birthday gifts, holiday gifts, education gifts for your children, friends and classmates.